The Kruuse Buster Tablet Introducer is a simple device to make administering tablets to your pet easier, with less risk of harm to your or your pet. Made with a long length and additional finger bars to protect your fingers from accidental nips, the reinforced tablet holder will hold the tablet securely and reduce the risk of damage to your pet’s mouth. 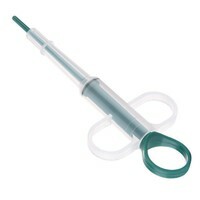 Water can also be drawn up into the barrel of the syringe and used to administer the tablet to aid in swallowing.